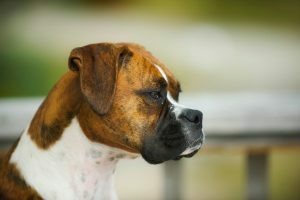 What is Thyroid Cancer (Adenocarcinoma) in Dogs? 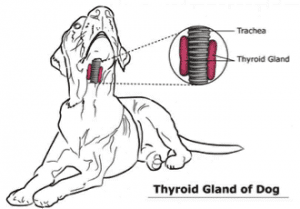 The thyroid glands are paired structures located along the windpipe (trachea), about halfway down the neck of dogs. The thyroid glands produce hormones that are vital for normal body function. Thyroid growths in your dog can be benign (adenoma) or malignant (carcinoma). Benign growths tend to get larger and may produce excess hormones; malignant growths can also spread to other parts of the body. 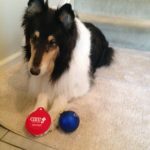 Does My Dog Have a Thyroid Tumor? The majority of dogs that have thyroid tumors have malignant tumors. Thyroid tumors are commonly seen in middle-aged to older large-breed dogs such as boxers, beagles, golden retrievers, and Siberian Huskies. They account for only 1.2–3.8% of all canine tumors. It is rare for a tumor to affect the hormonal function of the thyroid. However, it can happen, and in those cases, you will see additional symptoms. With hypothyroidism, your pet could be lethargic, have some hair loss, and suffer from exercise intolerance. In the case of hyperthyroidism, dogs can exhibit signs including heart trouble (rapid heart rate and abnormal rhythm), increased hunger and thirst, and muscle tremors. Surgical removal of cancerous thyroid tumors is often difficult because they can invade local blood vessels or other tissues. Therefore, radiation or chemotherapy is most often recommended for those masses that are incompletely removed or are too large for successful surgery. Stereotactic radiosurgery (SRS) is an advanced form of radiation therapy that has been proven effective in treating humans with cancer, including thyroid cancer. SRS is designed to cure cancer, not just ease the symptoms. What sets SRS apart is its unprecedented precision, which enables the destruction of the tumor with minimal damage to the healthy cells around it. SRS is a noninvasive therapy that puts a premium on your pet’s quality of life. There are far fewer treatment sessions, anesthetic events, and side effects, compared to conventional radiation therapy. Radioactive iodine (I-131) treatment has often been shown to be an effective adjunct to the treatment of thyroid tumors. I-131 can be utilized in patients that are poor surgical candidates or where vascular invasion has been identified in spite of surgical removal. Surgical removal of thyroid tumors has the best outcome if the mass is freely movable, less than 4cm in size, has not spread and can therefore be completely removed. Long-term survival (1 to 3 years) may be achieved in both dogs and cats. It is common for medications to be needed after surgery. If both thyroid glands are removed, your veterinarian may also need to check your pet’s calcium levels several times during recovery. This is because some parathyroid tissue is removed with the thyroid glands, and parathyroid glands play a role in calcium regulation. If surgery is not possible, then SRS may be a viable and successful option. No one knows your pet better than you do. If you see any possible signs of thyroid cancer, do not hesitate to contact your primary care veterinarian for a comprehensive evaluation. As with any illness, early awareness and detection is the key to successful treatment. We invite you to read their stories. 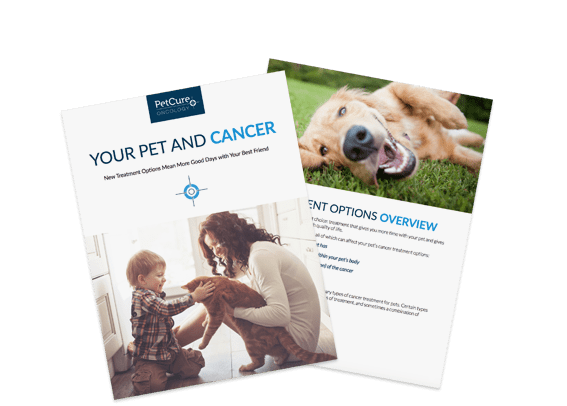 If your pet has been diagnosed with cancer, contact our Pet Advocates at (833) PET-HERO. Our team members are ready to help answer your questions.